Citronella Incense Sticks are made from Citronella oil, which is procured from the leaves and stems of different species of Cymbopogon, which is also used as a source of perfumery. Its smell will captivate your senses and leave you completely spell bounded. 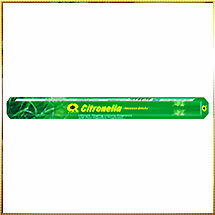 We have come up with an innovative range of Citronella Incense Stick that is deeply admired by one and all. We provide Citronella Incense Sticks in fancy and air tight packaging. Moreover, we offer it at highly competitive prices.